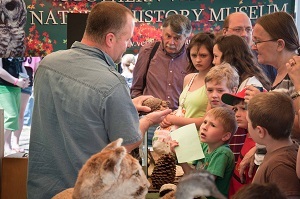 If you’re a wildlife enthusiast itching for spring then be sure to check out the nineteenth annual Herrick’s Cove Wildlife Festival on Sunday, May 5, in Rockingham, Vermont, presented by the Vermont Fish & Wildlife Department and Ascutney Mountain Audubon Society. Herrick’s Cove, on the Connecticut River, hosts one of the most popular festivals in the area, with organizers reporting close to 2,000 people normally attending. The festival includes a turtle walk with herpetologist Jim Andrews, a bug walk with Michael Sabourin, live hawks and owls, bird banding, a butterfly program, fishing activities with the department’s Let’s Go Fishing program, and several exhibits about fish and wildlife. Activities are scheduled from 10:00 a.m. to 4:00 p.m. The suggested donation is $2.00 for an individual and $5.00 for a family. Pets are not allowed. Herrick’s Cove is located just off Route 5, less than three miles north of Bellows Falls.